Trading within Diablo 2 involves exchanging in-game items for other virtual goods including gold and equipment. As a built-in feature, trading incentivizes players to create market economies and other forms of emergent exchange that go beyond interacting with non-playable-character (NPC) vendors. For game designers, this process builds community which further enhances a player’s investment into the longevity of a game's success. To that end, a direct correlation can be drawn between the strength of a game’s virtual marketplace—be it sanctioned or not—and its lasting impact on that industry. Although I poured hours into the hack-and-slash, dungeon crawling, and looting experience of taking my sorceress into the depths of hell, I never participated in trade, which quickly became a dominant aspect of playing Diablo 2. Some of my reservations about trading might have stemmed from a general discomfort with handling rare items; I was often uncertain about the exact in-game value of my loot. More striking and off-putting, however, was how aggressive it all was: the barking commands, the attempt to turn quick profits, the way the discourse emulated high frequency trading markets. It felt antithetical to the community building and social collectivity I appreciated in online play. Trading menu within Diablo 2: Lord of Destruction from the DjuntasGaming YouTube channel. While many game developers and studios have implemented online marketplaces, in-game trading recently came under scrutiny when Valve—a large game company that created the popular game distribution platform Steam—sent a number of cease-and-desist orders to online gambling websites. These third-party platforms use Steam’s marketplace of in-game items—specifically cosmetic, purely visual and not performance-enhancing, modifications of in-game items called “skins”—as collateral for traditional gambling. Skins are put up on sites like csgolounge.com and used as “chips” or other valuable currency to gamble in various low-skill to no-skill gambling games. What results is an external economy of virtual objects that can result in real-world payoffs. Where Steam prevents players from “cashing out” unused or unnecessary items, these third-party sites allow for players to use virtual items as away-from-keyboard currency. As fascinating as these online gambling venues are in their own right, Valve’s legal action against a total number of twenty-three sites points to a long history of virtual economies spilling over into AFK economies. Unlike the virtual economies fueled by blockchain technologies, the genesis of these economic frontiers is made from more traditional financial models like scarcity and rarity. 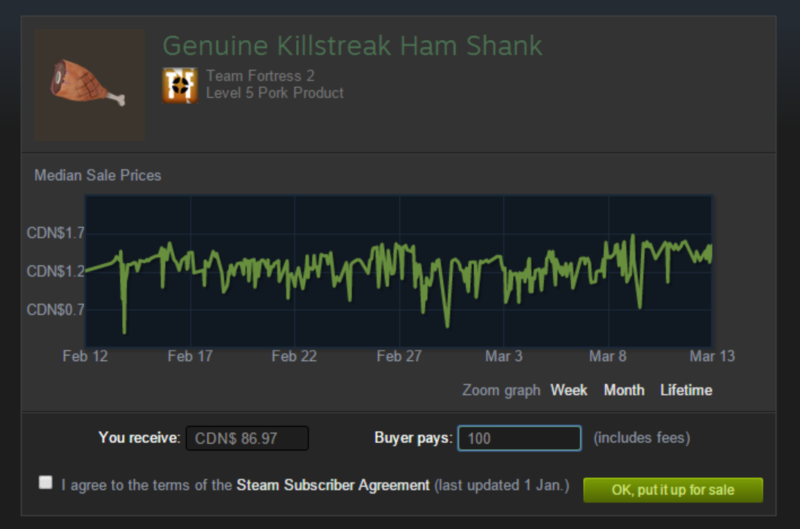 But more importantly, the valuation of “commodities” in CS:GO and other Steam marketplaces is rooted in preferential cosmetic desire which manifests in emergent and unexpected ways. Though scarcity plays a part in setting the price point of a skin, market dynamics are driven mostly by the personal tastes of players. In other words, the economies of these virtual items create monetary value primarily through player-centered appropriation of the in-game (and subsequent third-party) marketplace. This adaptation of, and experimentation with, non-traditional methods of media production and consumption is directly related to game development since the days of Diablo 2. In retrospect, I see how my apprehension to trading with strangers was not widely shared by other players. Blizzard Entertainment’s choice to include trading in Diablo 2 signaled a pivotal moment in establishing the marketplace dynamic now commonly promoted in most online games. What marked this moment of change was the possibility for players to trade among themselves rare and unique items they acquired in peer-to-peer exchanges. Trading was initially intended to allow players to purchase virtual items from other teammates (or party members) using in-game gold. But players quickly found gold to be undervalued for trades of particularly unique items. This was in part due to how easy it was to acquire gold from playing the same quest (or sequence of the central story line) over and over on different servers. Each time you connected to a server on battle.net, the game would re-generate areas, dungeons, and monsters that you could play numerous times to acquire large sums of money (and loot). But gold was also undervalued because a player could only carry a certain limited amount. As a result, players began to use substitute items within the game as currency itself, valuing equipment with objects like rings and jewels. A standard emerged within the player community that items could be valued roughly (given fluctuating market demands and game patches) by trading in rings called Stone of Jordans, or SOJs. Stone of Jordan as seen in the game. When equipped, an SOJ increased all special abilities of a player character, a distinctive and powerful property. SOJs quickly became the standard currency because of its predictable percentage “drops” from difficult, magically-enchanted enemies or bosses.1 Soon after this adoption, players started to “dupe”—a term used within gaming culture defined as creating illegitimate copies of unique and rare items—SOJs to meet market demand and sustain a newfound emergent economic system within Diablo 2. This system continued until 2001 when an expansion pack patch was introduced that changed the magical properties of the ring (by “nerfing” or devaluing its usefulness) and generated items that had an even more rare and powerful impact. Although this patch modified the overall value of the ring, the precedent set by SOJ currency fundamentally altered trade mechanics within contemporary online gaming. The notable aspect of this virtual economy is not merely its emergent genesis and its subsequent influence on game design. Instead, it’s the fact that it signaled to game players and designers alike the potential for in-game markets to create AFK value. This shift, fueled in part by growing player communities, provided an inroad for game companies to start thinking of ways to turn their virtual environments into viable self-sustained marketplaces. SOJ trading in Diablo 2 was not solely responsible for this transition, however. A much more pressing issue around virtual economies and their AFK value occurred with the selling and trading of gold in the game Ultima: Online. During its peak around 1997, U:O had over 200,000 subscribers all paying $9.95 a month to play online. Eventually, the in-game market required a substantial banking system to manage players’ gold yields from dungeon crawling. Some avid players created elaborate “botfarms” to automate the cumbersome and time-consuming process of mining in order to maintain in-game houses, guilds, and other social habits. Virtual economies like those around SOJs and U:O gold farming became important precursors for other types of marketplaces to emerge. Incorporation of in-game markets, and regulated economics systems for virtual currency have a mainstay in many contemporary games. Eve Online’s internal ISK currency is heavily moderated and overseen by a full-time economist on CCP’s staff. Second Life’s Lindens is also a popular example of a virtual economy that sustains in-game purchases, real estate, and other forms of trade. But the difference between these more established markets—including Steam’s Community Market, a formal exchange place for players to buy, sell, and trade virtual items distributed on Steam—and SOJs signal a particular manifestation of an internal, player centric, virtual currency supplanting traditional forms of wealth circulation. Today currencies within virtual economies, and the goods often associated within those markets, are manifesting in RL economies much more frequently. It is now commonplace in World of Warcraft and other MMOs for players to sell entire accounts to one another for hefty fees. The economy of generating virtual goods within various game engines isn’t merely popular amongst players, it’s encouraged by developers. In doing so, the backing of virtual entrepreneurship within game economies has changed the way that players view their status and impact within a game. Example of CS:GO gambling on CSGOlounge. Credit: csgogamlbingsites.com. Recently, the popular competitive sports game Rocket League has incorporated a system of item “crating” not all that dissimilar to Team Fortress 2’s item marketplace. Players can get crate rewards that contain visual modifications of various rarities for vehicles within the game. These crates, however, can only be unlocked with purchasable “keys” provided by the game’s developer Psyonix. Though the rules of the games are that crates themselves cannot be traded, the items within them can be swapped amongst players. This new addition has some long-time players worried; the incorporation of this mechanic has a high potential to generate an influx of individuals who only want to play Rocket League as metaphorical caravans and traffickers in the utmost rare cosmetics as opposed to the competitive and highly skill-based sports mechanic it is known for. Psyonix has explicitly pointed to the current predicament with CS:GO’s third-party gambling problem and want to avoid this new trading and crafting mechanics from sullying the value of the items within the game.4 However, what they cannot anticipate or prevent is an emergent market materializing out of a newfound virtual economy. If anything is to be gained from looking at the way SOJs became the (forgive the pun) gold-standard, it is that players will always find ways to manipulate, adopt, and appropriate economic systems to suit their desires. But what does Valve’s legal action against online gambling have to do with emergent virtual economies? The over-formalization of virtual economies—to make them and their goods operate and/or simulate AFK marketplaces—not only regulates the trafficking of skins and mods, it also devalues play. If it weren’t for the emergent behavior of players experimenting with the virtual goods of these in-game items, these virtual economies wouldn’t even exist. Honoring the cultural significance of virtual economies, however they manifest, should be the priority for game developers. Stifling, or otherwise over-determining, the emergent choices within gaming communities ultimately will do a disservice the wealth found within those markets. 1. Third-party “drop calculators” like Silospen were made to increase chances of ring drops and exploit the in-game engine to more predictably ensure SOJ retrieval from specific bosses and enchanted enemies.